When Vaughan Williams decided in 1909 that he wished to write an opera with a ‘prize fight’ at its heart he began an operatic journey that would last until the early 1950s. His boxing idea became Hugh the Drover, first performed in 1924. Five more operas were to follow: The Shepherds of the Delectable Mountains (1922), Sir John in Love (1929), Riders to the Sea (1936), The Poisoned Kiss (1936) and his operatic masterpiece The Pilgrim’s Progress (1951-2). The songs here have been transcribed for piano accompaniment by Vaughan Williams himself, and the majority are première recordings. Immediately striking is the purity of the singing on the disc. 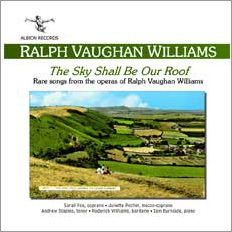 Roderick Williams is no stranger to Vaughan Williams, having made several recordings for Chandos. The other soloists… appear to be just as much at home in the repertoire. There are two duets on this disc (Ah! Love I’ve found you andHugh my lover) sung here by Sarah Fox and Andrew Staples – both pieces are simply beautiful. The voices weave around each other, creating the amorous mood that the text dictates. Iain Burnside’s piano accompaniment is spot-on throughout, sensitively capturing the variety of moods. These songs from three operas are most enjoyable and an indispensable supplement to your RVW songs shelf. The strong and responsive singing is most sensitively done.